TOP CGC AND CBCS COPY!! one of only 10 to ever come back in a 9.8 holder (9from CGC and this one from CBCS) and is truly deserving of the coveted NM/M grade. It is a perfect square-bound comic book with extraordinary colors, a ridiculously perfect spine (like you've never seen on a square-bound), beautiful edges and corners, fresh off-white to white pages, and an obvious unread (and unopened) look. 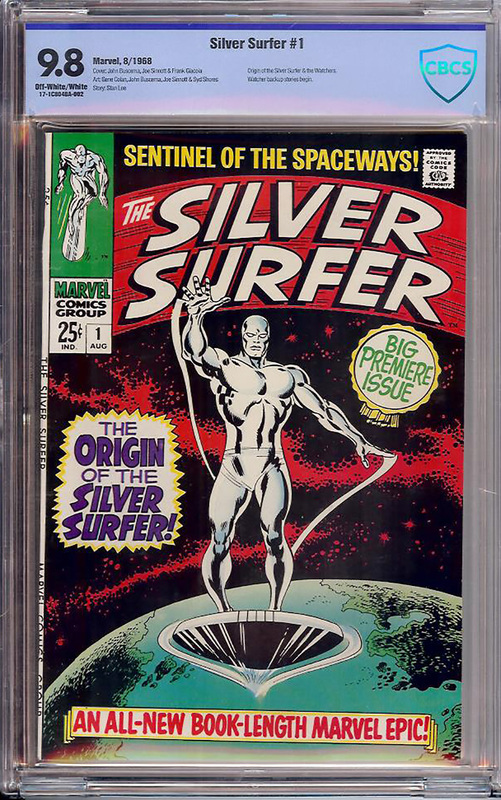 This comic is for serious Silver Surfer lovers who realize the importance of this book, which features the cosmos-spanning origin of this hugely popular character. Remember, there are 31 NM/M copies of Fantastic Four #48 (his 1st appearance). There are only 10 NM/M copies of Silver Surfer #1 and this beauty is easily one of the nicest example we've ever seen. The last one we had (a CGC 9.8 with similar off-white/white pages) sold for $33,000 in September, 2016.